Use jQuery placeholder plugins on your website to add placeholders for providing a better user experience. Placeholder is a text which holds on the blank space until the user fills it in with the required info. For instance, we normally see these placeholders in forms, email registration, or any other place where you are required to fill in the details. These placeholders provide you with the idea of what the kind of information is asked for or in what format you need to fill in the details. Example, you see DD-MM-YYYY on the vacant field for dates. 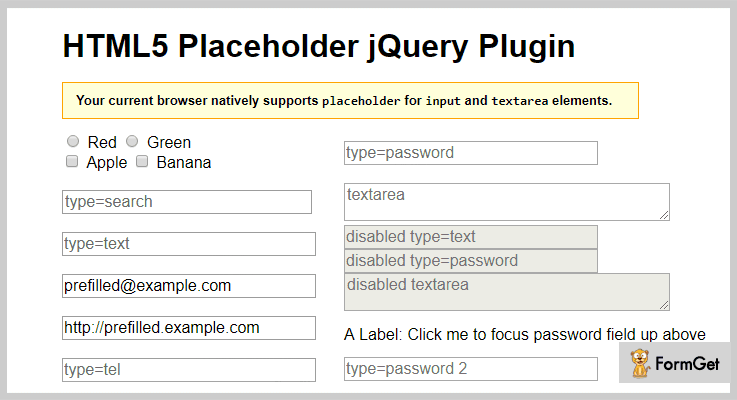 With the help of jQuery placeholder plugins, you can add this functionality to your website. These plugins allow you to customize the styling & appearance using CSS. Besides, these plugin comes bundled with illustrative demos & a nicely-written documentation. For this reason, we have combined a list of free jQuery placeholder plugins which will definitely prove to be of great help. So, let’s dive in & find the best jQuery placeholder plugin for your website. This is an outstanding jQuery plugin which allows you to create placeholders & customize them as per your requirement. Also, it provides you with various features that will allow you to customize the placeholder accordingly like you can change the size color, enter the text, and a lot more. Besides, it comes along with a well-written code & documentation which provides solution & ease in implementation. This jQuery plugin is available at ‘github.com’. You can download & get all the features along with future updates without paying a single penny. You can create several fields and add the text of your own choice to fill in the blank space. It allows you to change the color in the form of RGB, HEX or RGBA. This plugin enables you to change the size & radius of the placeholder in pixels. If you need a jQuery placeholder plugin which facilitates you with splendid features for easy customization and automatically detects the browser support. Then, this is just a perfect plugin. jQuery Placeholder lets you add text in the vacant space in various fields you want to. Besides, you can use <input type=”reset” /> to break the functionality & clear the fields. This plugin is cross-browser compatible, 100% responsive & easy to use. Also, you can easily install this plugin by inserting the few lines of code. You can access all the features of this at free of cost. Simply go to ‘github.com’ & download this plugin for free. You can add various fields for information that you want from your users like email, It enables you to customize the placeholders as you wish to by using CSS for easy styling. It stores the data entered once in the cache which can be suggested in case the user wants to enter the similar data. This jQuery plugin is built to provide a facility to add placeholders on a website. It provides you with a wide range of features like easy customization, you can modify the text, color, etc. Apart from this, it fits beautifully in all screen sizes & cross-browser compatible. Plus, it provides you with demos for better understanding. jQuery HTML5 is a freemium plugin. All you gotta do is download this plugin from ‘github.com’ without having to pay any price. This plugin enables you to customize the styling & appearance via CSS. It tests the compatibility before implementing the HTML5 placeholder in any browser. Jquery.ah Placeholder is an astounding plugin which provides diverse features for creating & adding text. Plus, you don’t need to worry about the cross-browser support as the plugin itself resolves the issues and supports almost all browsers. This plugin is very user-friendly & responsive to all mediums & screen sizes like mobile, tablets, desktops, etc. Get this jQuery plugin along with all its features without paying any price. Just go to ‘github.com’ & download it for free. You can modify the color of the text & several other attributes of the placeholder as you want to. 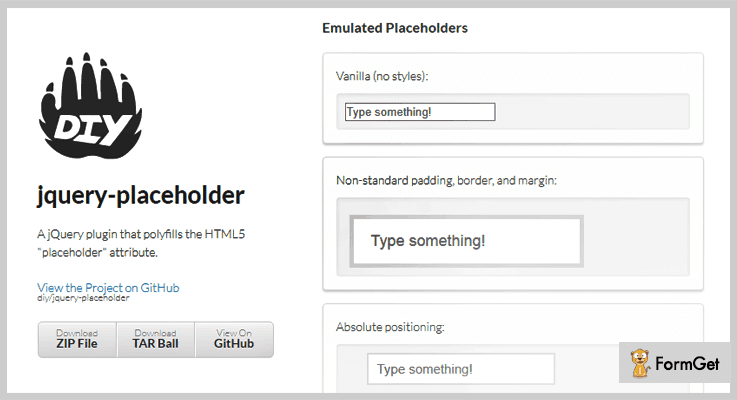 This plugin works with almost all the browsers even the that do not supports HTML5 placeholder. It empowers you to create placeholders & add the desired text to it. This is a freemium jQuery plugin which provides you with countless features like you can change attributes of the placeholder in the way you want to, add as many placeholders as you want, etc. Further, you this plugin has the ability to carve itself and make it compatible with all the browsers. Also, you can easily install this plugin by embedding few lines of codes. You can download this plugin for free from ‘github.com’ & get all of its efficient features as well. This plugin is cross-browser compatible & in case if some browser doesn’t support, it overrides the details. You can smoothly add as many placeholders as you want with the desired text. It enables you to customize the appearance as per your convenience. jQuery placeholder is free of cost plugin which allows you to add text on the blank space suggesting the kind of information required in the field. It provides you with a variety of options for customization & creation of placeholders. Moreover, this plugin is cross-browser compatible & 100% responsive. Simply download this plugin from ‘github.com’ & gain access to all the features without spending a single penny out of your pocket. You can change the color of text & background by using CSS. It provides you with override support through which you can ensure the compatibility on various browsers. Also, you can prevent the browser like Firefox from auto filling the content once it is refreshed. Finally, we have mentioned few of the finest jQuery Placeholder Plugins which will enable you to add a text in the box for time being. Until the user does not fill the vacant place, these placeholders will continue to display. We hope you must have found the perfect jQuery placeholder plugin for your website. By using jQuery Spreadsheet Plugins, you can easily embed a spreadsheet compatibility with Excel on your website or application. jQuery Confirm Dialog Plugins allow you to create dialog boxes other than the ugly looking standard ones. Integrate your website with jQuery Table Sorting Plugins to sort your data in a very crucial way if looking for different pattern or textures, highlights the rows & columns. At last, we hope you enjoyed reading the blog. Contact us for any more queries & suggestions. We’ll get back to you as early as possible.